In Liverpool’s Ranelagh Street, Lewis’s department store closed for good at the end of trade yesterday, bringing an end to a 154-year-old institution. Its closure had already been announced in February, prior to Vergo’s administration, to allow for the redevelopment of the iconic Lewis’s building. I hope to cover the history of Lewis’s in more detail in a future blog. 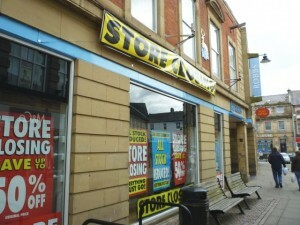 Of the remaining stores, the administrators MCR have already closed one, in Dovercourt, while closing down procedures are now underway at the other 18. However, MCR have confirmed that “discussions are ongoing with a number of different parties wishing to acquire part or all of the business”. 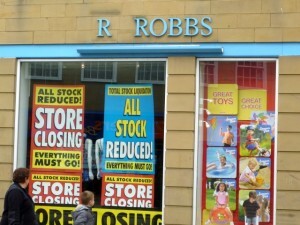 As far as I understand, firm closure dates are yet to be announced for any of the remaining stores; certainly, when I walked past Robbs in Hexham yesterday it had the ubiquitous ‘Store Closing’ signs up, but not yet the dreaded countdown announcing the number of days left before closure. 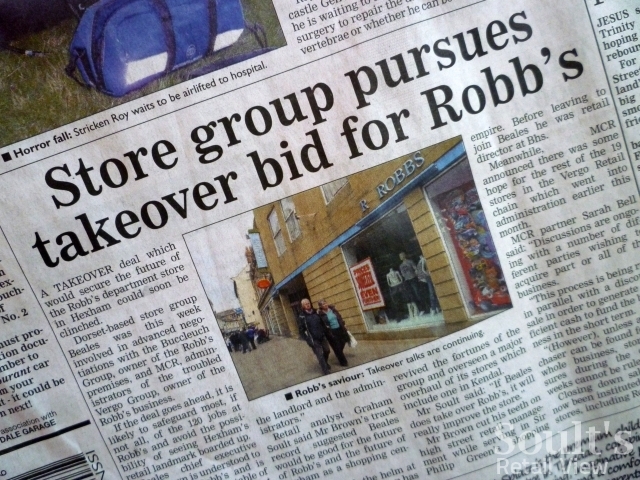 Following the earlier news that department store operator Beales had lodged “formal notice of interest” in buying Robbs, the front page of Friday’s Hexham Courant reports that the deal “could soon be clinched”. 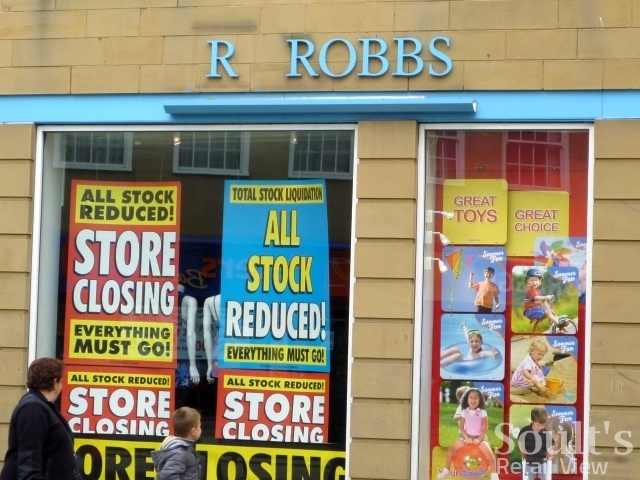 Beales’ Chief Executive Tony Brown has apparently visited Robbs, and is quoted as saying that his company is “continuing to pursue” its interest, and is “still in talks with both the landlord and the administrators”. For the third week in a row, there’s also a quote from someone called Graham Soult… I guess he’d better enjoy the exposure while it lasts! On that subject, The Herald newspaper in Plymouth quotes local entrepreneur Chris Dawson – owner of The Range chain of home, garden and leisure stores – as saying that he is “interested in a few of the stores, parts of the group and all of the stock”, the implication being that he may step in to take over Derrys in Plymouth or – perhaps more likely, given The Range’s lack of a fashion offer – some of the South West-based Homemaker stores. Described by Retail Week as “colourful”, Dawson’s record of buying up the stock of collapsed retailers such as Empire Direct and MFI is not to everyone’s taste, recognised in him jokingly styling himself as the “grim reaper”. 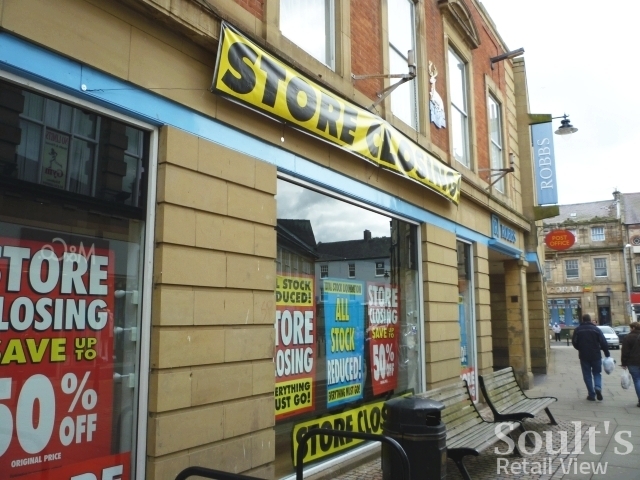 However, it’s difficult to argue with Dawson’s success as a retail entrepreneur, with The Range now expanded to 45 stores (up from 33 in February last year) including its first in the North East, recently opened up in the former Big W unit in Portrack Lane, Stockton-on-Tees. As yet, I’m not aware of any particular rumours involving Vergo’s stores in the east of England. However, the Norwich Evening News has reported[broken link removed] on how Vergo’s collapse has affected one local couple who had paid £900 for bedroom furniture from the Norwich department store, but who may not now receive their order or their money back. They are, unfortunately, far from alone – the Evening News’s story very much echoes an email that I received from Tony, asking what he should do about the £500 pram that his daughter had ordered and paid for from Derrys in Plymouth, but not received. As I suggested to Derek, the best place to start if you are an outstanding customer of Vergo Retail is to visit the Vergo page of the MCR website, which includes advice on how to proceed, including a downloadable ‘Outstanding Orders Form’. Well spotted Anna! The date of incorporation is given as 6 July last year though – while that is two days after the former East of England Co-operative Society stores passed to Vergo, it may just be coincidental timing. To be honest though, I’d have thought another David Thompson buyback is very unlikely. Could Vergo owner be about to buy back some of the stores. Previous Names:No previous name information has been recorded over the last 20 years.